Still almost a month of winter and the morning wind blows across the park with a bitter chill. When at midweek it seems like a good idea to invite friends for Sunday lunch, I think a rich chicken pie for my new English pie dish will warm us all. Tender morsels of poached chicken robed in rich gravy with seasoning vegetables and all tucked up under flakey pastry will fill the air with appetizing aroma. Cooking a couple of days ahead makes chicken pie a simple task. One day poach the chicken in a fragrant broth; chill the broth to remove fat. The next day prepare the gravy; make the pastry. 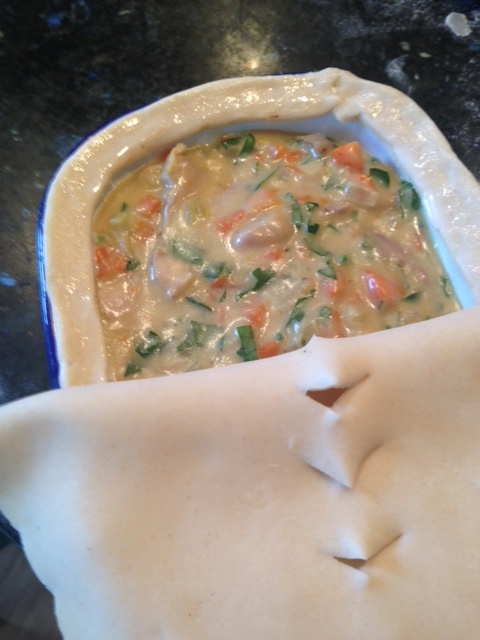 Bundle all into a lipped pie dish and chill the pie overnight. Forty minutes in the oven the following afternoon, and a princely feast awaits your guests. Pot pies once a household staple for using up leftovers became the babysitter’s supper after Swanson popped them in everyone’s freezer. Those pasty, tasteless pies with faked out chemical seasonings need now to be forgotten. It’s time to resurrect the real McCoy from the archives of traditional cooking. 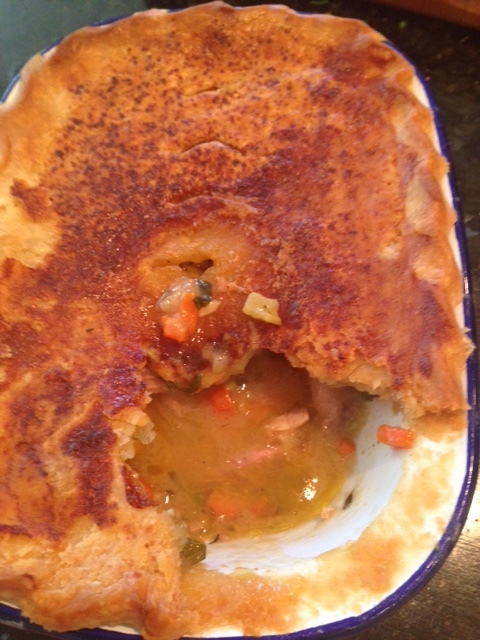 Your run of the mill pot pie had two problems: too much soggy pastry and tasteless gravy. We’ll solve the pastry problem with a deep dish pie and a crisp, buttery top crust. A superb gravy needs an excellent stock base. If you have a lipped deep pie dish, that would be the best container, but a standard glass pie plate or baker will work equally well. Give yourself time to prepare the pie in stages. Each step will take only minutes, and the Sunday lunch rewards will keep the hounds of late winter far from your warm table. This recipe makes a small pie that will serve 2-4, and it can easily be doubled for a family meal. Before you begin be sure you have good chicken stock, preferably homemade, and high quality, organic if possible, fresh chicken. I recommend thighs for tenderness and flavor. Choose a heavy saucepan that will hold the chicken snugly. Line the bottom of the pan with sliced onion, carrot and celery. Top with the chicken, skin side up; sprinkle with salt and add chicken stock to cover. Top with lid and bring slowly to a simmer. Poach the chicken for 45 minutes or until tender. Turn off the heat and allow the chicken to rest in the stock 15 minutes. Remove chicken to a plate. As soon as the chicken is cool enough to handle, remove the skin, bones and any fatty bits, returning them to the stock. Pull the chicken into neat bite sized pieces. Simmer the stock another 15 minutes. Cool and strain. Chill the chicken and the stock separately allowing excess fat to rise to the stock surface and harden. In a heavy saucepan, melt 2 tablespoons of butter and gently sauté the 2 oz. each onion, carrot and celery until softened. Add chopped garlic, thyme and sauté a few minutes. Add flour to the softened vegetables, stir to combine and cook for a few minutes. In a separate saucepan, bring the degreased stock to a boil and reduce to 1 ½ cups. Whisk the boiling stock into the flour-coated vegetables and stir all into a rich, simmering gravy. Boil gravy up a few minutes it seems too thin. Season with cream, salt, pepper, lemon juice and add a handful of chopped parsley. Once the gravy is nicely thickened, stir in the chicken, and pour the mixture into the selected pie dish, chill. Roll the pastry into a 1/8th inch thick circle or oval as needed. 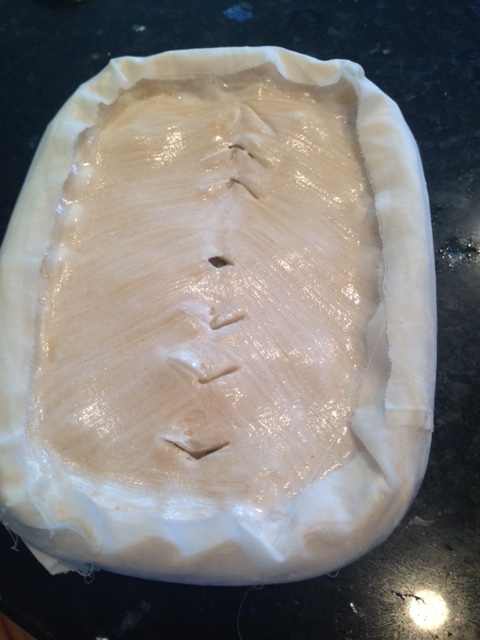 Cut several ½ inch wide strips of pastry. Moisten the lip of the pie dish and stick on the pastry strips to give a base for the top pastry.. Cut steam vents in the remaining pastry. Brush the pastry strips with water and roll over the top pastry, trim excess. Flute the edges and bandage with damp strips of clean cotton (torn from an old sheet or T-shirt.) This bandage will prevent the edges from burning. Chill the pie. An hour before serving, brush the top crust with cream or milk and bake the pie at 400° for 30-40 minutes or until golden brown. Turn off the heat and allow the pie to rest in the oven a few more minutes for further crisping. Peel off bandage. Allow the pie to settle a few minutes before serving. Add a green salad and serve 3-4. You are currently browsing the Mary Jo's Kitchen blog archives for March, 2017.